Choreography by William Forsythe. Music by Thom Willems. Cast: 川島 麻実子, 渡辺 理恵, 秋元 康臣, 河合 眞理, 崔 美実, 高橋 慈生, 伝田 陽美, 松野 乃知, 吉川 留衣. Premiere: 1987-05-30, 1987; Ballet de l'Opéra national de Paris. Cast: 吉岡 美佳, 乾 友子, 小川 ふみ, 木村 和夫, 梅沢 紘貴. Premiere: 1983-05-05, Nederlands Dans Theater. Choreography: Akram Khan. Music: Alies Sluiter. Cast: Sylvie Guillem (dancer), Prathap Ramachandra (percussion), Grace Savage (beatbox), Alies Sluiter (violin, voice, laptop). Choreography: William Forsythe. Music: Thom Willems. Cast: Brigel Gjoka, Riley Watts, with Sylvie Guillem. Choreography: Russell Maliphant. Lighting design: Michael Hulls. Music: Andy Cowton. 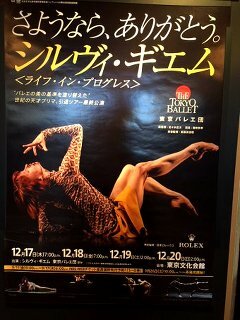 Cast: Sylvie Guillem, Emanuela Mantanari (La Scala). Music: Ludwig van Beethoven: Piano Sonata No. 32 (Opus 111), 2nd movement.